As a young woman falls from her father’s grace, she has nowhere to turn on a most dreadful and cold winter night, and she must find refuge for her little girl. If she returns home, is there any hope that she might find her father waiting with open arms? Otherwise she has one last resort—to sell her only treasure to greedy Mr. Griffin. In either case, the price might be too great. The drama deepens as John Griffin does the unthinkable! The stronghold of pride and the vice of greed take center stage as the tension rises and the mystery unfolds. 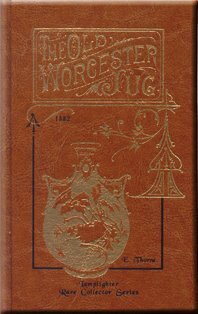 I would place The Old Worcester Jug as one of the top ten Lamplighter books! This fine book has been selected to showcase a unique Italian leather-tone cover, embossed in gold and black with deep grain marks of antiquity. Enjoy this wonderful story, and please, share it with someone you love.